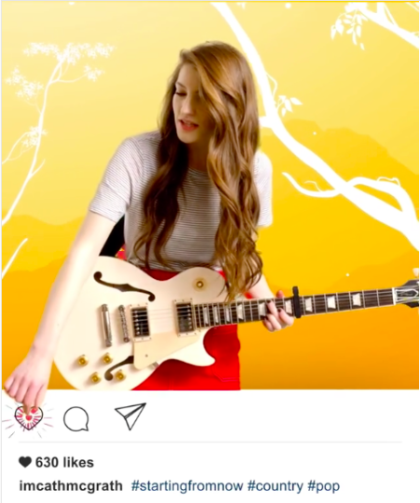 Hotly tipped country-pop artist Catherine McGrath has released a short video for her new single ‘Starting From Now’, which saw the young star hit the spotlight as Apple Music’s New Artist Of The Week and dubbed as “a new heiress to the Taylor Throne”. This is the first of four short videos that Catherine will release to accompany the upcoming tracks, which will form her brand new EP. It sees Catherine stepping into the world of Instagram, exploring innovative social media technology enabling her to interact with her ever-growing online fanbase through a collection of creative visuals and animations. ‘Starting From Now’ is a tale of love, heartache and triumph over life’s problems. It showcases the huge crossover potential Catherine has featuring a huge pop chorus alongside her much-loved country flair. On the day of release, it was added straight onto Spotify’s UK New Music Friday playlist as well as topping Apple Music’s ‘New Artists’ A List and iTunes ‘New Artist Spotlight’. Catherine’s musical journey has exploded since she moved to London from her hometown in Northern Ireland over a year ago. She is now signed to Warner Music and at the end of 2016 released her debut EP One, which has seen her dubbed as “one of the brightest emerging talents in country music” by Music Week and tipped as “one to watch” by The Times following her debut performances at this year’s C2C Festival at the O2 Arena. Bringing her stunning music to live stages across the UK, Catherine has just announced a show with Kelsea Ballerini at London’s Under The Bridge on May 11th as well as supporting The Saturdays’ Una Healy on May 14th at London’s Bush Hall. Catherine will also be supporting Irish indie-rock trio Picture This on their UK and Irish tour throughout May and June, which includes a date at Camden Town’s Electric Ballroom on May 18th. Co-writing with top songwriters in the UK and Nashville and turning heads across the UK and globally online, Catherine is rapidly becoming a very exciting prospect for 2017.